RILA Recognized at New England Foundation for the Arts 2017 CCX | RI Latino Arts • Blog • ¿Qué Pasa? 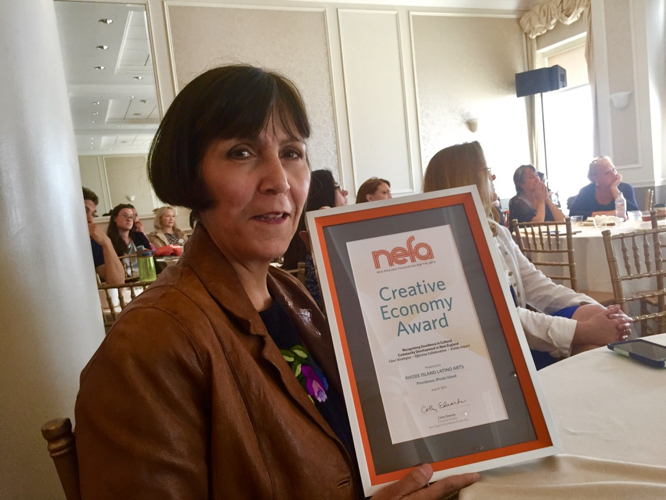 NEFA's Creative Economy award is presented to an organization in recognition of successful strategies, scope of impact on the creative economy, and possibility for replication in other communities. Marta V. Martínez, RILA’s Executive Director, presented a workshop on her work with Nuestras Raices and spoke about how, during a span of 30 years, the project has evolved by using art, community events, community story collecting & storytelling to bring people together to increase neighborhood pride. Her presentation showed how RILA through Nuestras Raices: The Latino Oral History Project of Rhode Island engaged and mobilized Latino communities in collecting and preserving their history and built bridges and connected communities: elders and youth; neighborhood and government organizations; the humanities and the arts.